ST Micro continues to churn out backside illuminated sensor applications. US20080017893 application solves the diffusion crosstalk problem. The solution is a retrograde doping of the substrate to form an electric field in vertical direction, so photoelectrons in the substrate are pulled toward the photodiode directly above them (or below them in backside illuminated pixels). The application shows that ST bumpes into the same problems like all the industry and uses the same approaches trying to solve them. I'm not sure this application will be granted, but at least it reveals that ST has a good team devoted to backside illumination. Another ST's application US20080017946 talks about reducing thermal gradients in back-lit sensors. The proposed solution is to use through-silicon vias to conduct heat to the bottom side of the sensor and then use thermaly conductive layer to spread heat equally over the sensor area. It's a popular solution used by many packaging designers, I doubt this patent would be ever granted. Well, may be in combination with backside illuminated sensor they can cut something. Application US20080018662 filed by Avago, now it probably belongs to Micron. To reduce crosstalk between pixels it proposes to put a shading elements in between them. That's it. One more thing, the shading is symmetrical to avoid artifacts. The application was filed in mid-2006, published just now. What I can say about it? First, I do not believe it will be granted, but if it will, I do not believe anybody can be sued for its infringement. Application US20080018762 comes from Micron and talks about reset transistor charge injection suppression. How it works? Very simple: when the reset transistor is turned off, its gate goes to some sufficiently low voltage, which is higher than the prior art ground. So, the charge injection becomes smaller. Many companies use similar solutions for various reasons, I don't think Micron invented anything here. Samsung US20080018765 application talks about hexagonal pixels with 2-way sharing. Very interesting read, just to learn what wild ideas these guys are trying! It gives example pixels layouts and how they plan to squeeze all the transistors in between. I'm unable to say anything about its novelty, buy I enjoyed reading this application. I don't think this is practical though. Yahoo: The new DevCam HD solution is a ready-to-build reference design consisting of a Micron 1.6MP image sensor (product number MT9M002) and a video processor (product number A2) from Ambarella. The high-speed imager and processor that make up the DevCam HD enable 720p HD video capture at 60fps. The design includes an HD fixed-focus lens. The new reference design is a production-ready solution for customers. Okay, and then one other question with regard to CMOS because I don’t think we’ve had a lot of discussion on CMOS -- any update on where you stand on that, both with regard to internal Kodak as well as deals with say Motorola or any of the other carriers? We’ll do more on February 7th but we just introduced one camera with our own CMOS in it and it is selling very well and it allowed us to go into a lower price point and keep our margins in good shape. We have the deal with Motorola that we’ll be delivering. Motorola has to announce introductions, I cannot, but in the next six months, you should be seeing products from Motorola and our contribution. And you will see an announcement that will come between now and the seventh, so I’m pre-announcing, which I shouldn’t be doing but I’m doing it anyway since I started, and we are going to -- we announced a series of breakthrough technologies about six months ago or something like that. Those are becoming a product and we will be announcing that that will be a product available for sale in the industry. I won’t tell you anymore but it will come in the next few days. We are making a lot of progress. This is a long cycle business. We have very good technology, good partnerships, so I feel very well about the business but it takes time to build this business. My guess is that Antonio means the new color pattern idea, instead of Bayer's. The idea was presented in mid June, so it fits Antonio's description. Probably Kodak is about to announce the first products based on this idea. Jay Vleeschhouwer, Merrill Lynch asks: You’ve improved thus far in the last year but can you continue that, and then let’s see, sensor technology, when do we run into the limitations of current sensor technology in terms of microns per pixel. There was some talk a year ago at the show about some physical limitations at the semi conductor level and when do you see this hitting the wall in that respect. John Blake, General Manager, Digital Capture & Imaging Devices: I’m not sure this was mentioned in the tour, one of the key elements of smart capture is also floating resolution. So rather than give you a standard mega pixel, e.g. give you an eight mega pixel shot in all situations, we will float the mega pixels that are available for the scene. So if it’s a low light scene, we’ll actually do things where we will pull back on the number of mega pixels that we use to shoot, do some pixel bending afterwards to bring out the light and therefore, actually I can prove to you that a lower mega pixel capture will be better than a higher mega pixel capture. In terms of a physical limitation. We’re getting pretty close on CCD’s at 12 and 14 mega pixels. I think that you will see over the next two to three years, certainly more prevalence of CMOS sensors into digital cameras because of some of the capabilities they will provide where again, I’d like to get the world focused on image quality not on the mega pixels. Shannon Cross, Cross Research: Just a couple of additional questions one with regard to digital cameras. On the CMOS opportunity that Kodak manufactured CMOS, what can you tell us about the sales of the five mega pixel that you put out, how you expect that to sort of move through your product line over time. If you talk to Canon or Sony and granite Sony has a major vested interest in CCD’s but if you talk to them, they’re not anticipating CMOS really moving into the compact camera line any time soon, so I’m just curious as to how fast you think it will move up. John Blake: So the first aspect of the success of 513, the C513 was a camera that we launched in the late, latter part of the summer, very attractive price point, five mega pixel Kodak manufactured CMOS sensor, did very well, is doing very well. We will not disclose individual data on a specific product but we’re very pleased with the results very pleased with the performance and the capability we’ve registered the important learning for the business of integrating a Kodak CMOS sensor into a Kodak camera. Going forward, I do believe that CMOS sensors will be in compact cameras. I do think that will happen over the next two to three years and having the capability and the technology we have in CMOS sensors does very well for us in bringing to life some of the unmet consumer needs in terms of the value they can provide for the end camera product. DPReview: Sony announced the development of a 35mm full size (diagonal: 43.3mm) 24.81MP high speed CMOS image sensor for DSLR cameras with pixel size 5.94um. There are a number of technical challenges to developing full (large) size image sensors, such as the propagation delay caused by using extended power circuitry and signal lines, and the difficulty of maintaining uniform sensitivity and signal saturation across the surface of the screen. Furthermore, because current photolithograthy systems are unable to cover the entire chip surface of 35mm full size CMOS image sensors, multiple exposures are required. This results in the difficulty of accurately controlling exposure variance and matching circuit patterns. Sony image sensor uses a system of joining multiple exposed patterns together and advanced planarization for minimizing fluctuation. Column-parallel ADC provides full-resolution frame rate 6.3fps. While we are at large sensors, Samsung's newly announced GX-20 DSLR uses its own manufactured 14.6MP 23.4mm x 15.6mm CMOS sensor. Another version of this sensor was designed in cooperation with Pentax and used in Pentax K-20D DSLR as well. OKI demonstrates FSE (Face Sensing Engine) and mobile iris recognition middlewares on 3GSM Mobile World Congress 2008 (MWC2008) in Barcelona, Spain on Feb. 11-14. 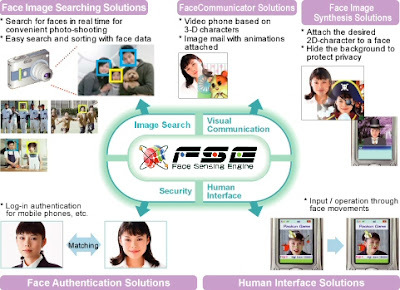 The possible Face Sensing Engine applications are shown on the picture below. The iris recognition is intended for user authentication for mobile devices. With other companes offering similar subroutines as well, these solutions become quite a commodity on imaging middleware market. Ambarella has introduced the A390 SoC that simultaneously captures 8Mpixels still pictures while generating and compressing HD video by H.264 codec in either 1080p60 or 1080i60 formats. The A390 captures data as fast as 480Mpixels/s, that is 60fps at 8 MP resolution. At this rate the A390 demosaics data from Bayer pattern to RGB. The 480MP/s capture rate allows a still image stabilization to improve low-light photography. Instead of capturing a single image in low light with a long exposure that results in a blurry picture, the A390 captures image sequences with short exposures. Then multiple images are combined to create a sharp, low-noise picture. This is the still-image equivalent of motion compensated 3D noise reduction. newratings: Analysts at Robert W. Baird estimate that OmniVision is gaining share of the high-growth image sensor market for PCs. The company’s performance in 2H08 is likely to be boosted by the use of video applications in higher-end smartphones, continued market adoption of VGA-based cameras in low-end mobile phones sold in developing countries and accelerated adoption of VGA sensors in notebooks. "ASG's revenues grew 9.1% sequentially and 13.3% year-over-year, led by imaging products, [etc]. ASG's operating profit declined sequentially due to the sequential increase in imaging device weighting" in the groups product mix. To me this sounds like STM's imaging business is losing money - correct me if I'm wrong. "The ASG gross margin in Q4 has reflected a significant base expansion of sales in the imaging business in camera modules. As you are familiar with this business, structurally ramps at lower margin due to the significant pass through of components like lenses. Frankly, we have also to admit that this is not, given the current competitive structure of the business, one of our most profitable and highest margin business. So I would characterize this Q3 to Q4 dynamic as driven substantially by some very positive news, by the way, of sales expansion and addition of [indiscernible] and camera modules." As Eric Fossum wrote in comments, most of the papers from 2007 Image Sensors Workshop are now on-line. This is a huge repository of knowledge and recent design news! Many thanks! TSMC patent application US20080014673 talks about a way to improve crosstalk between pixels. Even though the idea is applicable to both backside and frontside illuminated sensors, most of the figures relate to the backside version. The isolation between pixels is achieved by aluminum doped deep walls. A thermal process is employed to drive aluminum deep into the substrate. The substrate has a <100> or <111> orientation such that aluminum diffusion along the direction perpendicular to the substrate is much higher than aluminum diffusion to other lateral directions. Therefore, the aluminum doped deep wall can be formed without much lateral distortion. Height of the aluminum doped deep wall is determined by thickness of the substrate. Preferably the height of the aluminum doped deep wall is greater than one-fourth of the thickness of the substrate to reduce crosstalk. For example, thickness of the substrate is about 4 micron, height of the aluminum doped deep wall will be greater than about 1 micron. The aluminum doped deep wall may have a ratio of depth/width (or height/width) greater than about 3. The thermal process of driving aluminum may be a thermal annealing process performed by a tool such as a rapid thermal process (RTP) tool or a flashing annealing tool or a laser beam. The annealing temperature may range between about 400C and 600C. If this works, it might significantly improve the quality of the backside illuminated pixels. As a sidenote, this application reveals that TSMC spends its resources on backside illumination process development. Samsung application US20080012973 enhances dynamic range of the sensor by making 4T photodiode with two transfer gates, one - for low light level, the other - for high illumination. The main idea is to increase the charge storage capability by integrating the signal on a bigger floating diffusion capacitance for large signal, while the small signal gets advantage of higher conversion factor. I've seen many similar ideas in the past. Samsung's idea is a little different in details, but in any case I see it as of very limited use. Canon's application US20080012965 talks about accurately subtracting dark current. To reduce infuluence of hot pixels and other artifacts, Canon algorithm virtually builds a histogram of the dark signal distribution and tries to eliminate pixel outliers. It should work, albeit many similar algorithms work too. Micron's application US20080012966 improves row noise reduction circuit. Dark columns are usualy used to suppress supply and substrate noise by providing a reference signal for subtraction. If dark columns contain hot pixels or bad pixels, the reference signal acquires a row fixed pattern noise. To prevent that Micron proposes to use a separate dark section in the array, rather than full columns. Having separate TX, SEL and RST controls, this section provides a row address independent reference, so row FPN is eliminated. Sounds like a valid idea to me, with one exception. The separate TX, SEL and RST pixel controls have different length, thus row driver load and timing are different. This might affect the sampled supply noise, so row noise would re-appear. Another Micron's application US20080012971 uses the old analog trick to choose a quite sampling time when the system supply and substrate noise is minimal. The only twist I'm able to spot is usage of a programmable microcontroller or logic to set the right clock delay for sampling. To me this is not a big deal. Visera's application US20080011936 proposes to change microlens curvature across the array. I'm not sure the idea itself is new, but if Visera can really manufacture such microlenses, it opens a whole lot of interesting opportunities. Yahoo: Vision Research launches a fast Phantom V12 camera capable to record 1M fps at resolution 256x8 pixels. Phantom V12 is built around a specially designed, 1280x800 HD CMOS sensor. At full-resolution the Phantom V12 can record 6,315fps. The pixel size is 20um. To eliminate blur and accentuate detail, the camera features sub-microsecond shuttering, down to 300ns. Yahoo: Acceleware and Synopsys announced a new hardware solution that enables up to 20-times faster electromagnetic simulation of optoelectronic devices such as CMOS image sensors. The solution, which links Synopsys' TCAD Sentaurus Device simulator and Acceleware's ClusterInABox Quad Q30 workstation, enables an order-of-magnitude speed-up of the high accuracy finite-difference time-domain (FDTD) electromagnetic modeling algorithm used in Sentaurus Device. ClusterInABox Quad Q30 uses NVIDIA graphics processing units (GPUs), which deliver up to two Teraflops of computational power, to significantly accelerate FDTD simulations of optoelectronic devices. Yahoo: Magnachip announced HD-ready SXGA (1280x1024) resolution raw Bayer output image sensor. MC515ER sensor is made in 0.13um process, its pixel size is not mentioned. The speed is 30fps at HD resolution. It has low-EMI parallel and SMIA-compatible CCP2 interfaces. The sensor is said to have high QE and low read noise to enable "a Signal to Noise ratio (SNR) that is over 15 dB better than the performance available for typical sensors in the market today." I think Magnachip meant DR, rather than SNR here. The samples are available now. The MC515ER will be in mass production in the first half of 2008. Eric Fossum made a personal web site with very impressive publications list. Many papers are available in electronic form, including some hard to find ones. A lot of interesting stuff! Google significantly expanded its video library on technical aspects of photography. Now it includes nice lectures on white balance, high dynamic range imaging, future optical improvements and many others. Yahoo: In December 2007, Pixelplus started shipment of its PO4010 CIF SoC sensor to Samsung Techwin, which will assemble and supply completed modules with PO4010 for use in upcoming camera phones of Samsung. "We are quite unique as a privately held, pure play, turnkey solution provider for image sensors," co-founder Tim Baeyans told optics.org. Key advances include the capability to make large-sized pixels with low crosstalk, since the technique previously used at FillFactory worked well for small pixels but suffered from crosstalk on large pixels. "We also have new technology to make very large-area sensors with an acceptable yield, which allows to extend the size of the image sensor as compared with the wafer size," explained Baeyans. "Cypress has a patent application on a similar technique, but we have now filed an alternative, and more fault-tolerant, method." The Cmosis team has developed CMOS sensors for TDI image capture, which has previously relied on CCD technology. "CMOS implementations of such sensors were rather complex, but we found an elegant way of doing it," he said. "We will start by developing image sensors for specific customers with special needs, and who cannot find standard products to meet those needs," said Baeyans. "However, we are currently talking with customers to help us define a new standard product." 10 to 15 image sensor related patent applications are filed each week. Some present very interesting ideas, while some others just reveal the authors ignorance. Not all of them are garnted in the end. In this weekly review I discuss the ideas that I find interesting, useful or entertaining. Samsung tries to patent an idea of improving the resolution by moving the sensor, making few pictures and combine them into one with higher resolution (US20080007804 application). I see no difference between their idea and many similar ones used for many years in mass production. Backside illumination application US20080001179 from STMicro proposes a new passivation structure on the back side. The passivation process should be low temperature to preserve metal stake. So implantation with annealing is problematic. Instead STMicro proposes a MOS structure on the back side which can be placed into accumulation mode. Quite an obvious idea and I believe that others tried this well before STMicro's group. I missed this news at the time. In December 2007 SensL announced its Position Sensitive Silicon Photomultiplier Array (SPMArray). The SPMArray is claimed to be the first commercially available, solid-state, large array detector based on silicon photomultiplier technology. The standard version has 16 channels (each 3mm x 3mm) and a total area of 1.3cm x 1.3cm and can be customized upon request. The device is sensitive to visible light in the range of 400nm to 850nm. It can be interesting for applications such as PET, Gamma Camera, and Radiation Detection for medical and security purposes and to those working with fluorescence applications requiring very sensitive detector arrays. Yahoo: Tessera licensed its OptiML Wafer-Level Camera (WLC) technology and SHELLCASE Wafer-Level Chip Scale Packaging (WLCSP) solutions to Nemotek S.A. With these solutions, Nemotek will provide image sensor packaging services and camera module design and assembly for applications including mobile phones, laptop computers, security and automotive devices. Nemotek is a recently established company based in Morocco and led by Mohamed Lasry, the former chairman of STMicroelectronics-Morocco. Nemotek expects to begin volume shipments of its Tessera technology-based offerings in January 2009, with capacity plans for more than 150 million wafer-level camera units and 250 thousand image sensor wafers per year. Tessera also announced that Electronic Products Magazine has named its OptiML Wafer Level Camera (WLC) technology as a Product of the Year. Update: EETimes too runs a story on the licensing matter. Yahoo: Pixelplus announced that it secured a design win to supply its PO4010 CIF SoC sensors for use in Pantech camera phones. The company expects to start shipments to Pantech in the Q1 2008. EETimes: Guy Meynants, Jan Bogaerts, Tim Baeyens, Gerald Lepage and Lou Hermans from FillFactory-Cypress have founded Cmosis NV. The new company started operations in November 2007. The company has received 1.175M euros from the founders and Capital-E, a Belgian venture capital company. Cmosis plans to serve machine-vision, biometrics and motion analysis and other applications in medical equipment, scientific instrumentation and aerospace markets. It's said to have an IP portfolio related to high FF pixels, methods for creating large area sensors, fast and high resolution column-level ADCs, methods to increase DR and implement TDI in CMOS. Cmosis is finalizing contract negotiations with first customers for the design and supply of its image sensors. Measurements of dark current in a CCD imager during light exposures, R. Widenhorn, I. Hartwig, E. Bodegom, Portland State Univ. Dark current measurements in a CMOS imager, E. Bodegom, B. Kopp, W. Porter, R. Widenhorn, Portland State Univ. Mitigation of pixel scaling effects in CMOS image sensors, C. C. Fesenmaier, P. B. Catrysse, Stanford Univ. Mobile camera motion blur: not just a drunkard’s walk, T. J. Cooper, P. M. Hubel, Foveon, Inc. Exposure preference for digital still imaging: a psychophysical study, J. Li, H. Hwang, R. Velarde, K. Atanassov, X. Jiang, R. Hsiu, Qualcomm, Inc. There is also a basic course "Introduction to CCD and CMOS Imaging Sensors and Applications" by James Janesick from Sarnoff for those who need it. 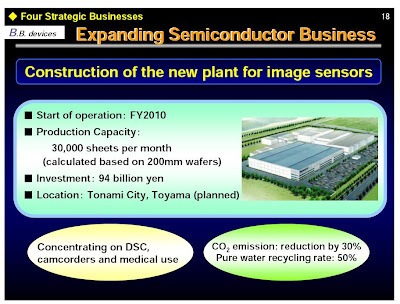 Yahoo: Panasonic announced its plans for the expansion of image sensor production facility at its Tonami plant in Toyama Prefecture, Japan. The construction of the new 48,000 sq. m facility will start in September 2008 and production will be launched in August 2009. Its clean room area will be about 10,000 sq. m. The company plans to invest 94 billion yen for the expansion. The sensors from the new facility are targeted to digital cameras, in-vehicle devices, camcorders, broadcasting and medical equipment. The new plant is said to be able to provide finer pixel features to increase the sensor resolution. After commencing production in August 2009, Panasonic plans to gradually increase its production capacity up to 30,000 8-inch wafers per month. In an unrelated announcement Matsushita Electric changes its name to Panasonic Corporation, effective October 1, 2008. Update: EETimes also published an article about the Panasonic plans. SiGe image sensor startup NoblePeak re-shuffled its management team with Mike Decelle joining the company as President and CEO while the former CEO and co-founder Cliff King takes the COO helm. NoblePeak approaches market introduction of its night vision camera cores in 2008. Yahoo: The new OV9710 is a 1MP sensor having 3um pixel pitch. Its speed is 30fps at full 1280x800 resolution or 60fps at 640x400 (WXGA) resolution. The sensor uses Omnipixel3 technology. So far only 1.75um pixels were claimed to be Omnipixel3. Probably the pixel name refers to the 0.11um process generation. The OV9710 incorporates image processing functions including exposure control, gain control, white balance, lens correction and defect pixel canceling. It is in samples now with volume production expected in Q2 2008. Imaging business lost $9M last quarter, down from $15-17M quarterly loss in Q2-Q3'FY2007. Imaging R&D expenses where about $37M for the quarter vs. $42M in Q3'FY2007. Overall the results are slightly better this quarter, although I hoped for a bigger improvement. Three sequental quarters in red complicate the spin-off process. Yahoo: In search for new markets Pixelplus announces a biometric SoC. The new sensor is combined with an image recognition engine on 32-bit RISC processor. The company expects the new PM1002 SoC to become a practical biometric solution with respect to iris, facial and fingerprint recognition for mobile and non-mobile security applications. Yahoo: Omnivision announced 1/4" VGA sensor with 6um pixels for notebook market. Other than large CRA (naturally), the notable feature is its 60fps speed in VGA mode and 120fps in QVGA. It looks like the former bi-annual International Image Sensors Workshop becomes annual. The next session will be held in the summer in Europe. Correction: My bad, the event is in 2009, so it remains bi-annual. Omnivision's Business to Go Down? "Based on industry contacts, we believe OmniVision will likely experience a reduction in order rates soon if it has not already due to overbooking last fall in the China handset market." "In October, OmniVision shipped more then 120 million image sensors to clients, a rate that cannot be sustained this period." "Prices should also come under increased pressure as competitor Dongbu gains market share, constricting OmniVision's gross margins." Samsung and Hynix competition might cause further ASP reduction. Personally I do not believe in near term competition from Hynix and Dongbu side. It will take them few years to become real competitors, if at all. Yahoo: Dongbu and its SETi subsidiary have completed development of a 1.3MP image sensor at the 110nm node. This is the first time that Dongbu openly mentions SETi, which became its majority-owned subsidiary in July 2007. The rumor is that the C.I. Sensor team formed the base of this new subsidiary (anybody can confirm?). The SETi establishment marks a departure from pure play foundry business for Dongbu. Now Dongbu becomes closer to Magnachip - a foundry and an IDM combined. May be this is the reason that one Dongbu customer - Pixelplus went with Sharp, while another one - Siliconfile develops sensors for Hynix. There is no word on pixel size, so one can guess there is nothing to be proud here. The PR only tells that the chip was developed in just 6 months. Siliconfile has ranked 5th in the global market in terms of image sensor production volume, even though it is a small fabless company with only 80 employees. In China, the company holds about 60 percent market share in the 2MP CIS market - very impressive. Siliconfile is the first Korean company to contract and export its 2Mpixel image sensors to Japan. One of its sales goals is to have the technology to minimize chip sizes down to 10-70% of competitors' chips - I don't believe in 10% number. Even 70% is hard to believe in, if functionality is the same. Looking into the future, Siliconfile has created a bio chip that combines sensors with biometrics technology, and is developing ultra-thin solar batteries - nice work, given it has sufficient resources. The strategic partnership is a necessity for fabless companies and it is the reason that Siliconfile has strengthened the strategic partnership with Dongbu. Shin Baek-Kyu expects that "DRAMization" will be the major topic of conversations in CIS markets in 2008. "The companies without the DRAM-based process will be eliminated in the CIS markets". It will be interesting to see whether Shin Baek-Kyu is right with his "DRAMization" claim. This explains why he decided to team with Hynix, even though the company is quite successful on its own with Dongbu. True, in theory DRAM process is simpler and much cheaper than CMOS, but it's still a long distance to realize these advantages. If ISP integration trend continues, CMOS based sensors would benefit from their faster and more logic-optimized process. Personally, I think there is a place for both technologies on the market and neither of them would be "eliminated" in the long or short term.